With all of the health risks involved with smoking like lung cancer, heart disease and emphysema, smokers are still lighting up in massive numbers. In response, all kinds of addiction treatments and cigarette alternatives have been created, from prescription medication to cigarette patches, in effort to reduce the numbers of smokers around the world. But here's a new one: A cigarette that doesn't contain solid nicotine, but Vitamin B of all things. The company Solar Cigarette has released an electronic cigarette and claims smokers can receive daily vitamin supplements by inhaling. And since the electronic cig isn't a real cigarette, the company says it can ultimately get smokers to quit their habit. If you're not familiar with e-cigarettes, they were first invented in 1963, and described as a safe alternative to traditional cigarettes. But manufacturing was never achieved due to limitations in technology, and other obstacles. Jump to 2004, when pharmacist Hon Lik from China, reintroduced an updated version of the electronic cigarette, and his company Ruyan starting exporting them in 2005. By 2007 the electronic cigarette received an international patent. Here's how the cigarette works: It contains liquid nicotine instead of solid nicotine, and when puffed an atomizer is activated. Once the atomizer is activated, it vaporizes the liquid nicotine and turns it into water vapor that's inhaled by the smoker. Adding Vitamin B to the electronic cigarette is a new component that Solar Cigarette believes will assist smokers in quitting traditional cigarettes, while giving them small dosages of the needed vitamin. But will the Vitamin Be-cigarettes really stop people from wanting traditional cigarettes? According to the Center for Disease Control and Prevention, 19.3 percent of all adults in the U.S. smoke cigarettes, and percentages of people successfully quitting run extremely low. Although it's reported that 69 percent of smokers want to quit, only 52 percent actually tried. In a May 2012 Wells Fargo survey it showed that over 73 percent of respondents believed e-cigarettes are a fad, and will be unsuccessful in the long term when it came to reducing the amount of smokers. But the amount of people using e-cigarettes counters the opinions of those surveyed, as 2.5 million consumers already use the product, and more will be drawn once the Vitamin B component is widely promoted. 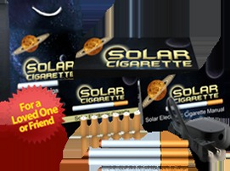 "The ever so life changing Solar Cigarette vitamin B pack. It's a one of its kind cartridge pack, which allows you to receive your daily vitamins and nicotine with every puff. While many people think that vitamins are similar in structure and perform a similar function, the truth is that each vitamin B-complex vitamin has a unique chemical structure and serves a unique function within the body," the company said in a press release. Perhaps not surprisingly, e-cigarettes have been far from trouble-free. Not long ago, a man was hospitalized after his Prodigy e-cigarette blew up in his face. Last September, the FDA issued warning letters to five e-cig makers, accusing them of making unsubstantiated claims and having poor manufacturing practices. Also, the FDA has said it plans to begin regulating e-cigarettes, which is likely to introduce a whole new level of scrutiny for the devices. Any way you look at it, an electronic cigarette still sounds like a strange way to get people to stop smoking. It would seem like one would need to make the more important mental shift of not wanting to smoke before quitting, and going through the routine of smoking with e-cigarettes could make it even harder to stop. It's similar to a person trying to lose weight by eating low-fat chocolate cake.